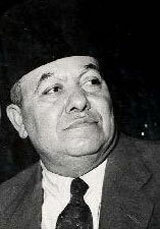 Abd el-Razzak el-Sanhuri (1895–1971) (Arabic: عبد الرزاق السنهوري‎‎) was an Egyptian legal scholar and professor who drafted the revised Egyptian Civil Code of 1948. He wrote the draft of the Iraqi Civil Code with the help of many Iraqi jurists guided by him. He initially backed the 1952 Egyptian Revolution by providing legal counsel to the Free Officers Movement and their governong body, the Revolutionary Command Council (RCC). Sanhuri left Egypt and helped draft the civil codes of the pre-Baath Syria of Husni al-Za'im (who ordered an exact copy of the Sanhuri Code to replace the majalla in 1949), Jordan (only completed and implemented in 1976, after his death), and Libya (1954) and the commercial code of Kuwait (drafted by Sanhuri but only concluded and implemented in 1981, already after his death. In 1970 Egypt awarded him its prize for social sciences. Sanhuri was known for attempting to recreate a "pure" Islamic law by modernizing the sharia using Western civil law (mainly of American and French inspiration), and the guidance when needed of a natural law obviously just to all, to guarantee justice above religion. Sanhuri died on 21 July 1971 and was buried in Heliopolis, Cairo. الوسيط في شرح القانون المدني الجديد، عقد الإيجار: شرح القانون المدني في العقود، مصادر الحق في الفقه الإسلامي، الدين والدولة في الإسلام، المدنية الإسلامية. الوجيز في شرح القانون المدني. السنهوري من خلال أوراقه الشخصية/ توفيق الشاوي. موقف الدكتور عبد الرزاق السنهوري من قضايا الحرية والديمقراطية/ فاروق عبد البر.